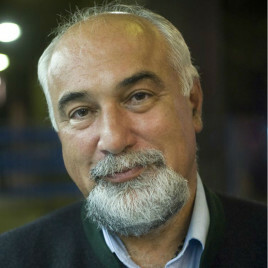 Varujan Vosganian (born 1958) – a Romanian politician and writer of Armenian descent; an essayist and a poet; the former Minister of Economy in Tăriceanu’s government. He has a degree in engineering; in the 1990s, he ran Radio Contact. He has published some books on politics and economy; in 2009, his debut novel The Book of Whispers came out, in which he tries to refresh the memory of the Armenian massacre that took place 100 years ago. In 2013, he published a collection of short stories The Game of the Hundred Leaves and Other Stories.